5793 labyrinths found. Showing 2901-2920. Sorted by country, state, city, then zip/postal code. We plan to have the labyrinth available during January 2006. An extension of the time or future dates will be included as known. For wheelchair accessibility, use the north church entrance. Paths are only 21" wide. Located at the corner of 2nd and Meridian streets, about 1 mile north of Kellogg/US 54/US 400. 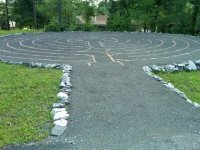 The labyrinth is available during Saturday evening worship, SoulSearch, 6pm-8pm Saturdays. Also available by appointment. It is located inside a church. Chalice, 6 circuit design from the classical tradition with labyrs for directional changes and visual effect. 29th St. runs E-W between Woodlawn and Rock Road in NE Wichita. The church & labyrinth is about 1/4 mi. west of the Rock Road Wal-Mart. From Louisville: Go Hwy 71 N. to exit 28 to 42 N into Bedford, KY. Take 421 and go 3 miles to Hwy 2870 which is also New Hope Rd. Turn left and go one mile to gravel driveway. (Note 1028 on mail box and sign Harmonizing Health Retreat. From Cincinnati: Take Hwy 75 South to 71 South to exit 34 whihc is Hwy 421. Turn right at right at the Shell station to stay on 421 3 miles past Bedford. Turn left on Hwy 2870which is also New Hope Rd. Turn left and go one mile to gravel driveway. (Note 1028 on mail box and sign Harmonizing Health Retreat. 38 34’ 53” ° Lat. ; 85 20’ 3” W° Long. There is a Chartres-style labyrinth in the floor of Carter Hall. It is open for use anytime the room is not being used. 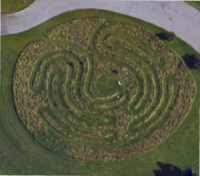 Open every Tuesday - 2:00 p.m. to 5:00 p.m.
Tuesday afternoons are reserved exclusively for the use of the Labyrinth by anyone. If you would like to reserve some time for your group to use the labyrinth, call the church office at 843-3191. The church is located on the border of Ft. Wright next to the James Ramage Civil War Museum. Easily accessed from the I-75/Kyles Lane-Park Hills exit, east on Kyles Lane to first stop sign, left on Highland Ave to Community of Faith Church on the left. You are welcome to walk the labyrinth at your leisure during daylight hours. Take E. Second Street to Norton St. and turn north (which is left if coming from Capital Avenue direction). Take a right onto River St. and labyrinth is on the left. 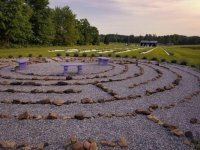 Labyrinth in middle of lavender farm. Grace Commons sits on property that was once part of the block where the famous Latham Hotel stood which was destroyed by fire in 1940. Grace Episcopal Church bought the property in November 2004. The Labyrinth is open to the public. It sits on the campus of Grace Episcopal Church in a park called Grace Commons which is on the corner of 7th and Liberty Street directly across from the front of the church. There are steps leading down from a parking lot on 6th Street and it is wheel chair accessible from 7th Street. ID#4008 Port Royal Neighborhood Assn. Northeast Lexington KY between Paris Pike and Russell Cave Road. Call for specific directions. Right-handed, five-circuit classical (Cretan), with meditation bench in center and motion activated lighting. Please note: the labyrinth is situated on a lot adjacent to the Old Episcopal Burying Ground - not at the Cathedral - but on property owned by the Cathedral. There is a community garden planted through SeedLeaf on the front part of the property and a gate that is not locked at night during the summer months. Also there is a gatehouse that is available for rental on the property with full kitchen and accommodations. The Walking Labyrinth is always available and can be found at the back of the lot between the OEBG and the Fire Station on Third Street. Nine miles from downtown Lexington, located in the retreat center of our Spiritual Growth Network and next to the Amazing Grace Wedding chapel, at the home of Janette and Paschal Baute.